Starting pitcher Matt Cain #18 of the San Francisco Giants pitches in the first inning against the Texas Rangers in Game Two of the 2010 MLB World Series at AT&T Park on October 28, 2010 in San Francisco, California. Matt Cain must not have liked hearing everyone talk about the postseason performance of Cliff Lee as if he were the only pitcher to be successful since the start of October. Or maybe he just didn't like the New York Times calling him an average innings-eater before this series got under way. Either way, Cain had good reason to be upset. He didn't allow an earned run in either of his two starts against the Braves or Phillies and it was hardly a fluke given his stellar regular season and outstanding career up until this year. Still, all anyone could talk about was Cliff Lee this and Cliff Lee that. They're going to be talking about Matt Cain now, though. 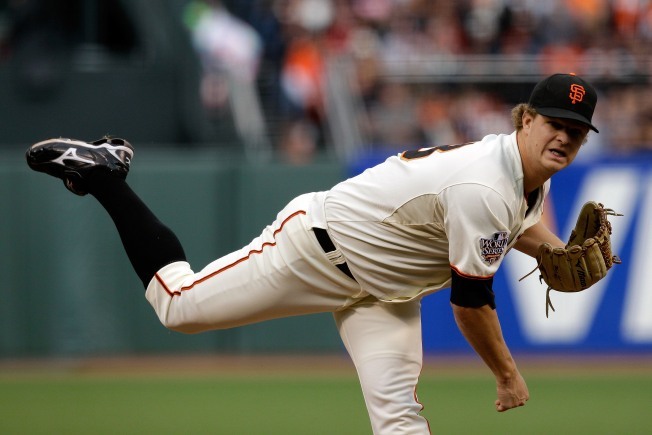 Cain shut down the Rangers for 7.2 innings and the Giants won Game Two of the World Series 9-0 to take a commanding 2-0 lead with them to Texas for the next three games of the season. Cain walked two batters and allowed just four hits as he kept the big bats of the Rangers from generating any activity on a night when the Giants bats reverted to their usual form. Well, for most of the night anyway, but we'll get to that later. Cain only faced one serious jam in the game when Texas put runners on second and third with two out in the sixth inning be he got Nelson Cruz and Ian Kinsler to pop out, though, and he escaped unscathed. He also got a bit of luck from the center field wall. In the top of the fifth, a Kinsler blast hit the top of the fence and improbably bounced back into play rather than over the wall for a home run. Kinsler was forced to remain on second as Cain got the next three hitters in order and it suddenly became a lot easier to buy an argument that the Giants were somehow a team of destiny. Cain certainly feels like a pitcher of destiny. He's now thrown 21.1 innings without allowing an earned run, the fourth-best total in Major League history, and he was just as sharp at the end of his night as he was when it started with a 1-2-3 first inning. He needed to be great because C.J. Wilson was up to the task of providing the pitcher's duel we thought we were getting from Lee and Tim Linceum in Game One. Wilson allowed just three hits before he left with a blister in the seventh inning, but one of them was an Edgar Renteria blast that did what Kinsler's couldn't and crossed the left field fence in the fifth inning. The old pro -- Renteria was starting his 61st career postseason game on Thursday night -- has had bigger World Series hits, but had never hit a home run in the Fall Classic before connecting off of Wilson. The Giants would add another run on a hit by early World Series MVP candidate Juan Uribe in the seventh inning and some awful relief work by the Rangers bullpen gave them seven more, but Renteria gave Cain and the bullpen all the breathing room they'd need to put the Giants two wins away from their first championship since ditching the Polo Grounds. The help from the Rangers pitcher and Ron Washington's willingness to let the game get completely away from his team was appreciated, but it hardly felt necessary. Since we're still a lot further away from champagne than the 5-0 lead in eighth inning that was blown in Game Six in 2002, we'll stop short of saying that this thing is there for the Giants' taking. Instead we'll just say that the Rangers should probably hope that someone leaves the Giants' mojo next to Tony Bennett's heart when they pack up to leave San Francisco.